The versatility and simplicity of this recipe make it an easy meal to enjoy. Not only are the ingredients easily prepared for the oven in about 10 minutes but the opportunities for substitution make this dish a great place to showcase your favorite seasonal vegetables. In this recipe, ingredients came from VABF-member farms. 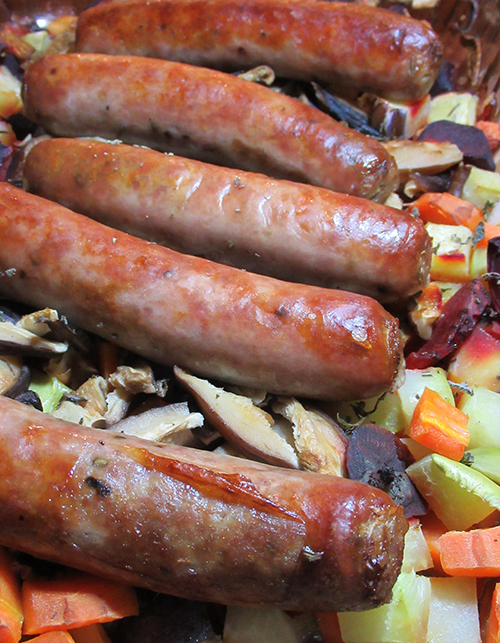 Italian sausages go well with the fresh fennel I had on hand but any sausages will do ̶ bratwurst, chorizo, andouille, kielbasa, chicken or turkey sausage as well. You can substitute any vegetables you have: carrots, gold potatoes, squash, beans, zucchini, or greens (e.g., collards or chard). During the summer months, I like to replace the root vegetables with sliced onions, peppers, and squash. This is a great recipe to feed a large crowd. I’ve also prepared it for a crowd of chicken processing volunteers. With rolls and potato salad it made a perfect meal to enjoy after the hard work of chicken harvest! Prepare the roots vegetables, using three of four of each. Peel beets and cube; strip the leaves and stems from the kohlrabi and cube; remove and save stalks from the fennel and cube the bulb; cube the sweet potatoes. Arrange the vegetables on the bottom of a glass baking dish. If using fresh shiitake mushrooms, clean and cut into strips. I was using dried shiitakes, so I put them in a bowl and poured about one cup of boiling water over them and let them sit for 10 minutes. Add mushrooms to the cubed vegetables. Prepare the herbs (I use sage, rosemary, and thyme). Finely chop the herbs. Add approximately 2 teaspoons of each and save some for garnish. Add the chopped herbs to the vegetables and mushrooms and toss gently. 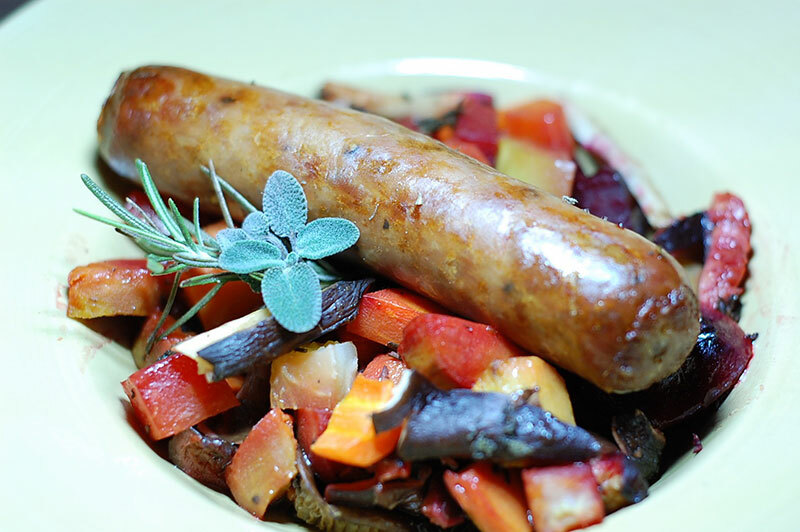 If your sausage is lean, you may wish to add 1-2 tablespoons of olive oil to the vegetables and toss to coat them. Add one cup of water to the dish. 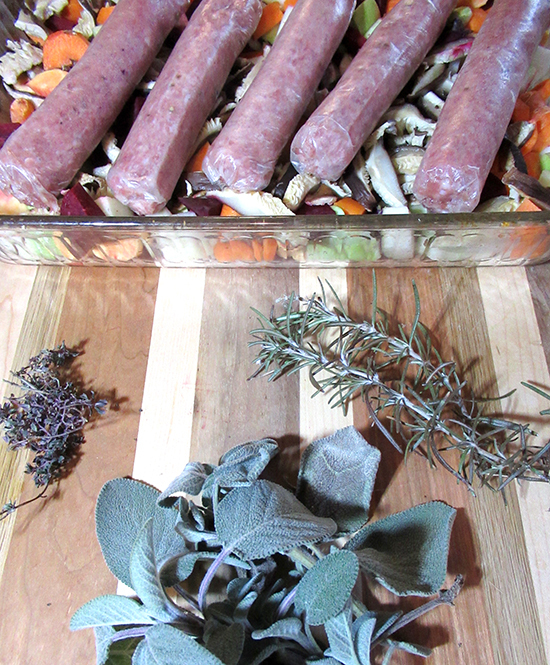 Lay the uncooked sausages on top of the vegetables, mushrooms, and herbs. Bake for one hour or until the sausages are cooked thoroughly. Plate, garnish with fresh herbs and the fennel tops, and enjoy!